We’d love your help. 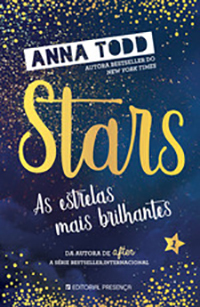 Let us know what’s wrong with this preview of As Estrelas Mais Brilhantes by Anna Todd. Anna Todd, a autora da série After, bestseller internacional, regressa com um romance surpreendente sobre o amor e os obstáculos que a vida nos coloca a cada momento. Após uma juventude dominada pela instabilidade familiar, devido à profissão do pai, militar de carreira, e ao comportamento rebelde do irmão, Karina Fischer, agora com vinte anos, é massagista em Atlanta onde Anna Todd, a autora da série After, bestseller internacional, regressa com um romance surpreendente sobre o amor e os obstáculos que a vida nos coloca a cada momento. Após uma juventude dominada pela instabilidade familiar, devido à profissão do pai, militar de carreira, e ao comportamento rebelde do irmão, Karina Fischer, agora com vinte anos, é massagista em Atlanta onde, já na sua própria casa, pela primeira vez se sente bem. Numa sessão de massagens, conhece Kael, um jovem ex-combatente, bem-parecido mas introvertido e com sinais de desgaste emocional causado por duas missões no Afeganistão. Karina habitua-se à sua presença silenciosa na qual vê algo que a tranquiliza e a ajuda a ultrapassar o caos familiar que marcou a sua vida. Kael mal a conhece, nem parece querer conhecê-la melhor e... fala muito pouco. Contudo, Karina vê neste homem misterioso a estabilidade de que necessita, e enche de silêncios as suas próprias ilusões. To ask other readers questions about As Estrelas Mais Brilhantes, please sign up. Hello, Is the Hero younger than th female lead? "I would always remember that, the way he made parts of me ache that I had never felt before. I would always be thankful for that." Having reasonably enjoyed Anna Todd's After Series, this was something of a letdown for me. It had its perks that made you want to read on... but they were a few and a well-spaced few. I have always taken notes on the books I read. I used to highlight, jot down and (vandalize) every book that meant something to me. However, when I start "I would always remember that, the way he made parts of me ache that I had never felt before. I would always be thankful for that." I have always taken notes on the books I read. I used to highlight, jot down and (vandalize) every book that meant something to me. However, when I started blogging late last year - I ended up doing it with every book I read. Regardless of its format. I do this so when it comes to review time, my review ends up being an honest interpretation of what I was feeling whilst reading the book. Sometimes that affects the rating, sometimes it doesn't. I often do it to remember the good moments, but there are some books that I highlight quotes so I can back up the claims I'm making on my review. That long winded introduction leads me to the first thing about this book that didn't mesh well with me. It had a premise and blurb that seemed so promising and unique, yet nothing really hooked on to me. I was reading because I had to and not because I want to. That being said, I actually remember enjoying her After series and her writing albeit atypical really works well with me. This book just didn't . The plot was mainly two dimensional and so were the characters for me. There were some really cliche and "instal-love" moments that had me cringing and wishing that the execution was better. I ended up fleshing out the setting and the context more than the characters and that made it really hard to invest myself into their chemistry. If you've already read the reviews, I'm pretty sure a lot of them will warn you that this is a part of a series. When the book had just been added to Goodreads, there was no indication that it wasn't a standalone and I went into it thinking that it was. There is a cliffhanger ending but I don't know if I plan on reading on. There wasn't any dialogue that felt realistic, a lot of lapses in narration and just an overall awkward feeling. The writing often had an "I did this then that then went there and did that" undertone with the flow and pace. I'm used to Anna Todd's unusually lengthy bouts of inner monologue in her text. However, in this it completely swallowed the romance and the story of the characters and their development. ➳I have never read an Anna Todd novel before, so I was taken a back at how much I truly enjoyed this novel. I was surprised when I got it as well because it arrived all of a sudden from my favorite publicist, and I am so honored and glad that she sent it over since I will forever cherish this novel and how incredible it utterly was. The characters, Kael and Karina have drawn up a true chemistry that is not very common to read in romance novels. Especially in a very tough romance where dealing with military life is at stakes. For many, (just like myself) it is a touchy subject since I get very emotional about it, but the back story that comes from Kael is definitely heart breaking since he is one hundred percent different from Karina. She is a ray of sunshine that is helping out her friendship with Kael, and convincing her heart to not let anything other than "friends" happen between her and Kael. ➳The angst is real, and there is no denying these two of being together. But the controversy of allowing changes to happen to Kael's life is what puts him at a pause. ➳Overall, this was a very interesting novel to read. The chapters were so short I couldn't believe how I was reading ten chapters in thirty minutes. However, the story that Anna has brought is one that has to be read for sure. Thank you to my favorite gal at LEO Pr sending me a copy of this beauty, I cannot wait for everyone else to enjoy it as much as I did! Wer hat nicht auf Anna Todd's neuen Roman hingefiebert? - Seitdem sie die Veröffentlichung ihrer neuen Trilogie angekündigt hat, war ich auf jeden Fall Feuer und Flamme und habe mich sehr darauf gefreut etwas neues von ihr zu lesen, nachdem ich After so geliebt habe. Natürlich sollte man in sich abgeschlossene Geschichten nicht miteinander vergleichen, aber ich möchte trotzdem im Weiteren etwas näher erläutern, was bei der After Reihe geklappt hat, jedoch bei "The Brightest Stars: Attracted" nur Wer hat nicht auf Anna Todd's neuen Roman hingefiebert? - Seitdem sie die Veröffentlichung ihrer neuen Trilogie angekündigt hat, war ich auf jeden Fall Feuer und Flamme und habe mich sehr darauf gefreut etwas neues von ihr zu lesen, nachdem ich After so geliebt habe. Natürlich sollte man in sich abgeschlossene Geschichten nicht miteinander vergleichen, aber ich möchte trotzdem im Weiteren etwas näher erläutern, was bei der After Reihe geklappt hat, jedoch bei "The Brightest Stars: Attracted" nur mäßig funktioniert. Wie wahrscheinlich jedem schon bekannt ist begleitet man in dieser Reihe Karina & Kael. Das erste Kapitel spielt in 2019, danach geht's jedoch wieder zurück ins Jahr 2017 und wir erfahren, wie die beiden Protagonisten sich kennengelernt haben. Karina ist dort gerade von zu Hause ausgezogen und arbeitet in einem Massage-Salon. Kael hingegen war Soldat in Afghanistan und ist gerade wieder in die Heimat zurückgekehrt. Wer die After Reihe gelesen hat, der weiß, dass wir dort die Geschichte von Hardin & Tessa miterleben, aber trotzdem die ganzen Nebencharaktere nicht zu kurz kommen - im Laufe der Bücher können wir uns dort eigentlich von jeder Person ein gutes Bild machen. Und ich hoffe das dies bei "The Brightest Stars" nicht anders sein wird, denn im ersten Band hat man leider sehr wenig über die Charaktere erfahren. Sie waren mir alle zu schwammig konstruiert, weswegen ich auch nicht wirklich mit Karina & Kael mitfühlen konnte und mir ihre Beziehung mehr oder weniger "egal" war. Von den Randfiguren muss ich gar nicht erst anfangen, denn ich habe es nach rund 350 Seiten nicht mal richtig geschafft sie wirklich auseinander zu halten. Was mich bei After außerdem nicht sonderlich gestört hat, mir hier aber ziemlich auf die Nerven gegangen ist, waren die kurzen Kapitel. Anna Todd hat es bei Kapiteln mit 2-3 Seiten einfach nicht geschafft Spannung aufzubauen. Im Gegenteil: Ich hatte die meiste Zeit des Buches das Gefühl es ist überhaupt nichts passiert und für mich schien alles so ereignislos. Natürlich sollte man bei einer Trilogie nicht direkt die ganze Handlung auf einmal verschustern, allerdings habe ich mich bei Karina & Kael gefragt, warum nach über der Hälfte des Buches nichts zwischen den beiden passiert und kurz bevor sich die Geschichte dem Ende neigt geht alles direkt von 0 auf 100. Zudem habe ich mich beim Lesen auch die ganze Zeit gefragt, wie man sich nach so wenig Handlung überhaupt ein Ende mit einem spannenden Plottwist zusammen schustern kann. Ich habe erwartet, dass irgendwas passieren muss, was total überdramatisiert wird und das ist letzendlich auch eingetreten. Karina und Kael haben sich wie zwei unreife Teenager verhalten, die einfach alles überdramatisieren. Außerdem habe ich jetzt nicht das Gefühl ich müsste auf der Stelle weiterlesen. Ich habe eher das Gefühl eine Geschichte, die gut ein Einzelband hätte sein könnte, wurde weil es sich marketingtechnisch angeboten hatte, auf eine Trilogie gestreckt. Anna Todd tenta la carta della maturità e, come in un romanzo di Liala, tenta di raccontare la malinconia delle giovani spose dei militari in guerra. Sembra una storia del 1932, ma è ambientata nell'epoca degli smartphone. C'è anche una scena che, se fosse un film, sarebbe un pianosequenza di diciotto ore alla Béla Tarr su una festa dove NON SUCCEDE NIENTE. Diciotto capitoli, DICIOTTO, in cui NON SUCCEDE NIENTE. After a chapter in 2019, we go back to 2017. Karina is 20 years old. She's just left home - her dad and new step-mom's place - a little while ago, and now she's more or less happily living her life and working at a massage place. The new guy in her life is unfortunately not the only exciting thing Karina has to deal with. Her family is a tiny little bit challenging too .... and Kael's military past and present also have to be dealt with. What will happen with Karina & Kael? WILL THERE BE A HAPPILY EVER AFTER??? BUY THE BOOK TO FIND OUT! I remember way back when Anna posted the first Chapter on Wattpad - I read it, even though I hate Wattpad. But I just had to read it after all her teasing about it. And I remember loving it! I didn't read any more on Wattpad, I stayed strong and now I finally have the book! It has this slow and sad and heartbreaking mood throughout. But we also see some adorable smiley moments from Karina and Kael. I just adored those two. I had to keep on reading just to see Kael smile! LOL! It takes Karina ages until she even gets a word out of Kael. He's a silent thinker. But he doesn't mind her talking. Non stop. Adorable. But of course we just know that there's a lot of baggage behind Kael's silence. He doesn't talk about 'work' - about the war. And he doesn't share much about anything else. And we just want to know allll the things about him. I loved Kael and Karina's conversations. She talks, he listens ... and I think that they're both falling in love a little bit more with every word she says and he doesn't. If I had to complain about a little thing... I'm writing this while still reading the book - I'm only halfway through it now. And I have no idea how it will end... BUT. What I do know is that there will be three books in this series!!!!! And NOWHERE on amazon or goodreads, does it say so. I only know because the german publisher already has all three books/covers up on their website and on amazon ... Book 2 will be out 2019 and book 3 in 2020. WHAT???? I will be so mad if there will be a cliffhanger and nobody told us about this being a series! I'm still living with the problably very false hope that the three german books are just one book cut into three shorter parts. Back now after finishing - and yup. Cliffy. Not a realllly bad one - nobody got shot or anything, but it's so not finished. And I'm tempted to almost call it borderline criminal what Anna and the publisher did. Not telling people they're not buying a standalone, but book #1 in a trilogy? Not nice at all, because I wouldn't have bought the book if I had known. I'm one of those readers who has to read a series once all books are out. (#Booksalzheimers!) That's obviously why they did it, to make more money. Not ok! Another tiny little thing. The writing. While very beautiful at times. Sometimes it's very confuzzling. Anna jumps through the days so weirdly. Something happens and then Karina's walking home and tells about what happened last night and suddenly it's a while later and she's telling us about another thing. I was really confused at times. And sometimes I didn't know who was talking. And the slowness of the whole book - the relationship.... it was a bit too slow and uneventful for my tastes. It all just blubbers along so slowly and silently. Like lying in the sun next to a little creek with a bit of a slow John Mayer song softly playing in the background. I know, I'm weird. Nothing happens almost all through the book, not even a kiss, and then suddenly they're dating and lying in bed? And it all happens within a week. It's so very weird. Which is making more sense, now that I know there will be three books about K+K. And then the thing, the secret, the 'lying'? I didn't think it was all that bad? Karina mega-exaggerated about the whole thing. But I have to remember that they're all only 20 years old. So they're allowed to react immature. Maybe another editor should've gone over the book again. There were some things that a really good editor would've changed. THE BRIGHTEST STARS was such a heartbreakingly beautiful & funny & moving & mysterious & exciting & adorable military & coming-of-age love story dramance! Run to your nearest amazon for your own Kael - this one is MINE!!!! Da ich die After Reihe damals total geliebt habe, hatte ich großer Erwartungen an dieses Buch. Zu aller erst möchte ich sagen, dass mir das Lesen echt Spaß gemacht hat. Ich liebe kurze Kapitel, da habe ich immer das Gefühl schnell voran zu kommen. Ich fand das Buch nicht schlecht, aber die Geschichte war sehr nichtssagend. Ich habe vieles nicht verstanden, manches ging mir einfach zu schnell. Außerdem fehlten mir total die Emotionen. Bei After fuhr ich die ganze Zeit auf einer Achterbahn rauf un Da ich die After Reihe damals total geliebt habe, hatte ich großer Erwartungen an dieses Buch. Ich fand das Buch nicht schlecht, aber die Geschichte war sehr nichtssagend. Ich habe vieles nicht verstanden, manches ging mir einfach zu schnell. Außerdem fehlten mir total die Emotionen. Bei After fuhr ich die ganze Zeit auf einer Achterbahn rauf und runter, hier überhaupt nicht. Ich weiß nicht, ob es an der Überätzung lag oder an dem Schreibstil von Anna, aber es war echt nicht gut geschrieben. Esperaba mucho más. Sabéis que yo soy de las personas que disfrutó AFTER, así que obviamente esperaba que este libro me hiciera sentir eso. Y aunque me ha enganchado, la historia en general me ha aburrido bastante y no me interesaba mucho. Se nota lo que ha intentado hacer la autora. Dar un giro total a sus historias para que no la critiquen por lo mismo que la criticaron en AFTER y en eso, puedo decir que lo ha conseguido... pero haciéndolo ha creado la relación MÁS SOSA que he leído en un libro romántico en mucho tiempo. Que suplicio me daban las escenas de los protagonistas, les faltaba sangre en las venas. Luego el tema del ejército... me ha aburrido hasta límites insospechados. Me daba igual Jael, el padre, los amigos, los clientes, el hermano. Así que he acabado hasta el moño del tema. Luego en muchos momentos la historia era muy ¿confusa? Sentía que faltaba información o que se explicara mejor. „Nur“ 3 Sterne für meine liebste Anna Todd ABER das Ende war unglaublich gut! Nur leider waren so 75% des Buches in viel zu kurzen Kapiteln, die mich einfach unfassbar gestört haben und meinen Leseflow nicht gerade gefördert haben. Die Thematik ist an sich interessant, aber ich bin mit der Geschichte und Kael einfach nicht warm geworden. Im Nachhinein weiß ich nicht, was eigentlich großartig passiert ist.. irgendwie nicht viel. Freu mich trotzdem auf Band 2, wenn der so weitergeht wie das Ende d „Nur“ 3 Sterne für meine liebste Anna Todd ABER das Ende war unglaublich gut! Nur leider waren so 75% des Buches in viel zu kurzen Kapiteln, die mich einfach unfassbar gestört haben und meinen Leseflow nicht gerade gefördert haben. Leider war die Handlung ziemlich langweilig und ich habe keine große Bindung zu den Charakteren aufgebaut. I should state that I didn’t know that this wasn’t a standalone. I honestly just saw that Anna Todd was coming out with a new book and wanted to read it! If ya’ll could have seen my face when I reached the end of the book and realized that the ending was a cliffhanger, you would have laughed at me! Our two main characters are Kael and Karina. Kael was a soldier who has just gotten home. He doesn’t really talk much and Karina notices something about him. Something that makes her want to get to know him. Karina is a massage therapist that’s trying to distance herself from her army father and his new wife. For the most part, I did like our main character Karina. I related to her in a way that felt like home. The way she deals with things and her thought process felt really familiar to mine. Does that make me a mess? hell yeah, it does. The chemistry between these two was there but it was always something there that made it seem like the author was holding back. Also, I’m still a little confused about the timeline! Did they know each other for 2 weeks for longer? In this book, we have two people helping each other heal while falling in love along with family drama and some secrets that come to light. This ends on a cliffhanger that could almost be considered brutal. Like I said before, I was unaware that this wasn’t a standalone. So while it wasn’t an absolute favorite of mine, I will still be reading the next book because I need to know what happens next! ** ARC provided for an honest review. Quotes were taken from an ARC and are subject to change upon publication. I have a love-hate relationship with this author. Some books of her’s I love some I hate. This one is in between, I didn’t love it but didn’t hated it either. There were things that really bother me about it, like the end (what was that? ), the romance and the characters in general. I wasn’t hooked at all reading this book. Which is sad, because the synopsis seemed quite interesting. The writing was okay, although at some times it pissed me off how quick everything passed. And how I couldn’t connect with any of the characters. I don’t know why they like each other. This is mine major problem with Anna Todd books, I never understand why the characters like/love each other. This could have been a standalone, and the thought that I have to read 2 more other books so their story can have a conclusion makes me mad. Because they don’t need 3 novels. One is more than enough. I guess this is in between 2/2.5 stars. But I’m still a bit conflicted. Overall this was bad, but not bad enough for me to DNF. 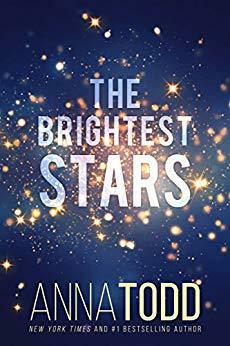 Anna Todd writes a melancholy slow burn story about abandonment, deceptions, survival, and love in The Brightest Stars. We carry the marks of our childhoods –be they good or bad- with us into our adult lives. What doesn’t break us makes us stronger as they say, however sometimes, whilst we may have an inner strength, we also develop traits of insecurities, skepticism and a self-preservation that can impact us as negatively as it can positively. Karina has had a disruptive childhood with absent parents added to the difficulties that come with growing up in a military family. The strains and the impact of this life as well as being abandoned by her own mum has influenced how she currently lives her life. It’s not a bad life, however, her self-inflicted constraints rules a large part of it. A twenty year old girl who has already experienced more than most women her age she has a somewhat cynical view yet at the same time she’s certain in her wants and needs. Karina came across lonely, with only her twin brother a positive constant in her life. She’s protective, forgiving and nurturing despite them being the same age. Karina braces herself automatically against life in some respects. We felt for her the whole way through and understood her actions to be an instinctual consequence to what was taking place around her. As this story was entirely in Karina’s pov we never fully connected with Kael, but oh did we want to. His story, alongside Karina’s, had a solemnness to it. A twenty year old solder back from war who is clearly struggling physically as well as emotionally. We were desperate to get into his head to uncover how deep those evident scars ran. A man of few words, you just know that the words he does set free are relevant and meaningful. This man is the quiet to Karina’s inner storm. No road to stillness, calm and love runs smoothly though. Secrets are uncovered, hearts are broken and loyalties are tested. Some bonds are stronger than others when faced with adversity at a most inopportune time. Love needs roots to grow and find its strength or the roughest current can dislodge it, making it harder to hang onto and preserve. We were left with a heart full of emotions as we wait for the continuing story of Karina and Kael. 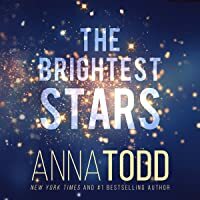 In The Brightest Stars, Anna Todd writes a very different character driven story with such detail and emphasis on life and its daily routines. An emphasis on people, their actions as well as thoughts, ensuring the -we as readers- become fully immersed into the fray. Das erste Kapitel findet im Jahr 2019 statt. Danach geht's zurück nach 2017. Karina ist 20 Jahre alt. Sie ist gerade von zu Hause ausgezogen. Zu Hause war das Haus ihres Vaters und der Stiefmutter. Jetzt lebt sie mehr oder weniger glücklich ihr eigenes Leben und arbeitet in einem Massage-Salon. Aber er ist ein Kumpel des Mannes von Karinas bester Freundin und Mitbewohnerin ... und es sieht so aus als würde er heute Nacht bei den Mädels nächtigen. Der neue Kerl und die neuen Gefühle sind leider nicht das einzig aufregende in Karinas Leben. Ihre Familie ist ein ganz klein wenig kompliziert und anstrengend ... und Kaels Militär-Vergangenheit und Gegenwart und die damit verbundenen Geheimnisse müssen auch verarbeitet werden. Was wird passieren mit Karina & Kael? Wird es ein Happy End geben??? KAUF DIR DAS BUCH UM ES HERAUSZUFINDEN! Ich kann mich noch erinnern als Anna das erste Kapitel auf Wattpad gepostet hat. Ich habs damals gelesen und geliebt - obwohl ich Wattpad hasse! Aber das wollte ich unbedingt lesen und es war wirklich ein tolles erstes Ausschnittchen - aber weiter hatte ich dann nicht gelesen - ich wollte auf das Buch warten. Und hier ist jetzt endlich das 1. Buch!!!! Karina braucht ewig bis sie überhaupt ein Wort aus dem Kerl rauskriegt. Er ist mehr so ein stiller Denker. Aber ihn stört es überhaupt nicht, dass sie so viel redet. Non Stop! Herzallerliebst! Natürlich wissen wir schnell, dass hinter Kaels Schweigen einiges an Problemen und Erinnerungen aus dem Krieg stecken. Er redet gar nicht über all das. Auch über so ziemlich nichts anderes redet er eigentlich. Obwohl wir doch ALLLLESSS von ihm wissen wollen! Ich fand die Unterhaltungen von Karina und Kael so toll! Sie redet - er hört zu.... und während sie das tun verlieben sie sich langsam in einander ... mit jedem Wort das sie sagt und er nicht sagt. Es ist alles so sehr süss und goldig ... aber es geht auch alles sehr ans Herz - im negativen Sinn. Weil wir einfach wissen - nach dem 1. Kapitel - dass es für die beiden so bald kein Happy End geben wird! Es ist auch alles sehr 'nah-an-der-Zeit' - mit dem Militär und Rassismus, etc. - und vor allem ist alles auch dezent aus Annas Leben. Das fand ich auch super. Wenn ich mich über ein paar Kleinigkeiten beschweren dürfte? Ich habe das Buch auf Englisch gelesen und kein Mensch, kein Verlag, kein Goodreads, keine Anna hat jemals erwähnt, dass es eine Trilogie werden wird. Das fand ich sehr unnett. Geldmacherei-ig. Dann - der Schreibstil. Irgendwie war der sehr verwirrend hier und da. Es ist schön geschrieben an sich. Aber ab und zu hab ich nicht kapiert was was war. Wer gerade spricht und warum sie von irgendwas erzählt was gestern stattfand und dann aber auf einmal wieder ins Jetzt springt und dann nach morgen ... ich war dezent verwirrt! Dann ... das Buch war mir zu langsam. Die Beziehung der beiden war irgendwie so langsam und ereignislos für meinen Geschmack. Es blubbert alles so vor sich hin. Als würde man in der Sonne liegen ... neben einem Bächlein und es läuft ganz leise ein John Mayer Song. Ja, ich weiss, ich bin bekloppt! ☺ Aber es passiert irgendwie nix! Noch nicht mal ein Kuss und auf einmal - bam - sind sie zusammen und liegen im Bett? All das in einer Woche und ohne darüber gesprochen zu haben? Seltsam! Naja gut - es werden drei Bücher - da kann sich das ja alles noch entwickeln. Ich finde, für das englische Buch zumindest, hätte noch mal ein Lektor drüber gehen sollen. Da gehört für meinen Geschmack einiges geändert. THE BRIGHTEST STARS war eine wunderschöne, herzergreifende und goldige Love Story! Eilt zu eurem nächsten Amazon-Händler und kauft euch euren eigenen Kael - der hier gehört mir!!!! Karina has grown up in a military family. Her father is in the army and her whole life has been spent living on posts all over America. Pretty much everyone she knows is military too. She and her twin brother Austin made a pact to never follow in the career footsteps of their father. In an effort to cement her independence, Karina has managed to purchase her own home and is doing well in her work as a massage therapist. She has a fractured relationship with her dad and her Tuesday night dinners with him are more than enough time spent in his presence. When a new customer does a walk in for a massage, Karina struggles to get any conversation out of him. He is obviously military and has recently returned from overseas assignment. After several more appointments she eventually gets to know Kael and after a while Karina develops a huge crush on him but he is a hard person to read. Their friendship is hard work on her side but eventually things to develop into something more. In fact it is Karina’s first time falling in love. This book started quite well but then it just kind of fell away. I liked Karina and her quirky, chatty personality but I struggled to feel the connection between her and Kael. I completely understand that the way he was with her is normal behaviour for someone who has recently returned from overseas combat. However, it was hard to figure out that they were actually ‘together’ - it felt kind of forced. I liked how much Kael changed when he was with Karina but then it just kind of ended with things up in the air. I have mixed emotions about this book and I can’t really figure it out. When I signed up to read an early copy there was no indication that this was part of a series so I had assumed it was a stand alone. This meant that the closer I got to the end of the book the more confused I was about there being enough time to resolve things. The first chapter of this book is set in the future so I guess I was trying to figure out how we were going to get back to that setting. Decían que ésta historia era algo más madura que After. Y qué razón. Ha sido una sorpresa.Una historia que me he leído en nada, ya que los capítulos son cortos. Ho finito questo libro da una settimana, ma ci ho rimuginato parecchio prima di scrivere la mia recensione. Tanto per cominciare vi avviso che Stars è il primo libro di Anna Todd che leggo, la serie After non mi aveva mai ispirato, quindi non conoscevo minimamente lo stile di scrittura di questa autrice, molto popolare tra le ragazzine più giovani e le fan dei One Direction. La trama di questo primo volume della serie new adult The Brightest Stars si presenta interessante e in linea con i miei gusti di lettrice, ma a fine lettura non ho potuto ritenermi affatto soddisfatta, anzi. La storia inizia con uno sguardo al futuro, al 2019, dove i due protagonisti principali, Karina e Kael, si rivedono per la prima volta dopo un certo periodo di lontananza, in occasione di un funerale. Di chi? Questa è la domanda che probabilmente vi invoglierà (forse) a continuare a leggere la serie, visto che poi l'intero romanzo è ambientato nel 2017, partendo da quando i protagonisti si vedono per la prima volta. Karina ha 20 anni ed è cresciuta nelle basi dell'esercito visto che il padre è un militare. Ora vive da sola e si mantiene lavorando come massoterapista in un centro benessere. Lavoro interessante, se non fosse che a fine lettura potreste benissimo dilettarvi nel mestiere anche voi, visto tutte le inutili scene di massaggi a cui ci tocca assistere. Kael è un giovane militare taciturno e distante. Interessanti caratteristiche, mi piacciono i personaggi misteriosi, peccato che non si riesca pienamente ad inquadrarlo per tutto il romanzo. Di lui si intuisce qualcosa, ma non viene mai approfondito a dovere. E questa secondo me è stata una grave mancanza, perché il protagonista maschile è importantissimo, deve saper conquistare e trasmettere delle emozioni! Della trama non vi dico nulla, anche perché è proprio piatta e povera di avvenimenti. Capisco che il primo libro di una serie che prevede gli stessi protagonisti possa essere introduttivo, ma deve anche essere in grado di accattivarsi il lettore e fargli agognare il seguito. In questo Stars ci riesce giusto nella parte finale, quando le cose iniziano finalmente a farsi interessanti. Peccato che sul più bello si gira pagina e ci si ritrova con i ringraziamenti. Come avrete notato, durante la lettura ho accumulato diverse perplessità, ve ne risparmio alcune perché altrimenti dovrei entrare nel dettaglio delle scene e non voglio spoilerare nulla. L'autrice cerca di toccare anche delle questioni attuali come il razzismo, ma anche in questo caso è tutto troppo approssimativo e superficiale! Io ci sono poi arrivata in un secondo momento … fate voi. Il libro si fa leggere comunque in fretta, non ci si perde molto tempo, ma se dovete scegliere tra le tante proposte editoriali posso dirvi che se vi guardate in giro in libreria trovate di molto meglio. Se ne avrò l'occasione, leggerò probabilmente anche il seguito, giusto per vedere se la storia si risolleva, e di chi è quel funerale anticipato all'inizio del volume! In generale, questo libro è un grosso bah. Als Leseexemplar von der Kollegin bekommen, war ich doch recht neugierig auf dieses Buch. Immerhin ist es Anna Todd! Bisher hatte ich noch kein Buch von der Autorin gelesen, deshalb war ich entsprechend neugierig. Nach etwas über 100 Seiten in denen ich mich beinah zu Tode gelangweilt habe und gleichzeitig nicht verstanden habe, wie jemand ein so bekannter Autor sein kann und dabei so schlecht schreibt, habe ich beschlossen das Buch quer zu lesen um zum Ende zu gelangen. Gott sei Dank waren die Kapitel nur immer etwa drei Seiten lang, so kam man immerhin schnell voran. Die Hauptperson Karina sagt zwar im Klappentext, dass sie eine strickte No Dating Policy hat und somit keine Beziehung will, kaum tritt aber Kael auf, ist sie von ihm fasziniert. Aber nicht auf diese typische „OMG ein Eight-Pack!“ weise, obwohl Kael natürlich ebenfalls verdammt gut aussieht. Sondern eher von einer beinah kreepy Art und Weise. Nun gut. Allgemein hält sich Karina für recht cool, sie hat mit 20ig endlich ein eigenes Haus (!!! Ok, es ist Amerika!) und es ist auch kein Ding diesen fremden Typen einfach bei sich wohnen zu lassen. Nichts gegen fremde Typen aber fremde Typen die gar nichts sagen und nur teilnahmslos mal so in der Story sind? Und dann nimmt sie ihn auch einfach mit ans wöchentliche Essen mit der Familie? Hä? Manchmal gab es so seltsame Sprünge in der Story die sich einfach nicht fliessend lesen liessen. Nach 100 Seiten war echt nichts Spannendes passiert und Kael hat vielleicht 5 Sätze gesagt. Sätze die aus „OK. Ja. Nein. Vielleicht“ Bestanden. Ein richtiger Traumtyp halt! Aber Karina will ihn ja irgendwie eroberern, auch wenn das nicht ganz so klar ist. Dann hat ihr krimineller Bruder heimlich ne Party im Elternahaus wo sie und Kael auch sind und was lässt unsere Heldin für Sprüche von sich? „Ah ich komm nicht in mein Zimmer, aber das ist normal, manchmal schläft ein Typ seinen Rausch in meinem Bett aus oder ein Pärchen vögelt da.“ Ich habe mir das Zitat leider nicht markiert aber ich dachte nur so: ooookay… nun gut, Geschmäcker sind verschieden, vielleicht steht sie ja darauf. Auf jeden Fall sind die beiden urplötzlich zusammen und ab da kommt der Stein ins Rollen und ein Teil des Geheimnisses um Kael kommt zum Vorschein. Das war dann so an den Haaren herbeigezogen, ich konnte nichts mehr ernst nehmen. Und dann Zack Einfach praktisch mitten in der Szene Ende und es schreit geradezu nach: LIES WEITER! Alles in allem waren die Charaktere einfach schräg und nicht liebenswert. Die Chemie zwischen den Beiden war nicht vorhanden, die Story war unspektakulär, peinlich und langweilig und der Schreibstil war wirklich, wirklich nicht gut. Anna Todd lebt gemeinsam mit ihrem Ehemann in Los Angeles. Sie haben nur einen Monat nach Abschluss der Highschool geheiratet. Anna war schon immer eine begeisterte Leserin und ein großer Fan von Boygroups und Liebesgeschichten. In ihrem Debütroman AFTER PASSION konnte sie ihre Leidenschaften miteinander verbinden und sich dadurch einen Lebenstraum erfüllen. Ich bin ein sehr großer Fan der "After" Reihe von Anna Todd und natürlich war ich sehr auf ihren neuen Roman gespannt. Der Schreibstil ist wie gewohnt super flüssig, gut zu lesen und sehr spannend. Die Story wird in der Ich- Perspektive aus Karina's Sicht erzählt. Die Kapitel sind kurz und knapp, was den Lesefluss sehr gut macht, denn man fliegt förmlich durch das Buch. Ich habe es in einem Tag gelesen, da ich mir gesagt habe ein Kapitel geht noch, und dann war das Buch schon zu Ende. Karina hat mir als Protagonistin sehr gut gefallen, sie war mir sehr sympathisch und ich konnte mich bis auf eine Situation sehr gut in sie herein versetzen. Kael ist ein sehr düsterer Charakter, und ich kann ihn auch zum Ende des Buches nicht richtig einschätzen. Man merkt das er schlimme Sachen erlebt hat und möchte diese Sachen auch unbedingt wissen. Die Liebesgeschichte war richtig süß und authentisch. Man konnte die Spannung und Anziehungskraft sehr gut spüren. Die beiden haben auch sehr schnell eine feste Bindung zueinander aufgebaut. Das Buch endet mit einem Cliffhanger, den ich aber nicht ganz so schlimm finde, es lässt sich auf alle Fälle erstmal aushalten. Ich finde es nur schade, dass es so lange dauert, bis die Folgebände erscheinen. Übrigens ist das Cover auch wunderschön, die Sterne sind auch so geprägt, dass man sie fühlen kann, hier einmal ein großes Lob an den Verlag. Für mich war es eine stimmige Liebesgeschichte mit viel Spannung. Ich gebe dem Buch 4,5 Sterne. Started off okay but started to devolve irrevocably halfway through. It felt like a first draft of a novel that hadn’t been filled out or fully written yet. At times it jumped straight into the middle of something without any context. There were plot holes and rushed sections one moment but then incredibly unnecessary details and repetitive statements a page later. And then the random mood swings and extremely escalated emotions toward the end that just felt disingenuous. I didn’t feel connected Started off okay but started to devolve irrevocably halfway through. It felt like a first draft of a novel that hadn’t been filled out or fully written yet. At times it jumped straight into the middle of something without any context. There were plot holes and rushed sections one moment but then incredibly unnecessary details and repetitive statements a page later. And then the random mood swings and extremely escalated emotions toward the end that just felt disingenuous. I didn’t feel connected to the emotions anywhere throughout this book. The timeline was too rushed and the backstories weren’t enough to make it feel believable. De todos os livros que já li desta autora, este foi o que menos gostei. Para começar, fala de um tema que não me suscita muito interesse, depois tem uma história que não cativou a minha atenção e um fim que não gostei nada. I almost DNF'd this one, but because I love Anna so much and am the biggest fan of her After series, I kept on! This one was just all over the place for me. My dislike for Karina was strong and a lot of her inner monologue (that stretches far and beyond, dear lord) really stole from the romance in this one. I kept waiting for it, braced myself for the slow-burn, but...just didn't get it. At all. It was just awkward. I hate that this didn't do it for me, but I'm also a sucker for the second book in I almost DNF'd this one, but because I love Anna so much and am the biggest fan of her After series, I kept on! First of all, I am an absolute cover snob and I’ve seen a run of really bad ones lately (so sad), but this was an exception. Beautiful, classy, and attention grabbing. The designers and Ms. Todd should be commended because I have deep cover envy here. “The Brightest Stars” began with a lot of potential. I adore stories that are told in a past/present narrative and this one begins with the introduction of Kael and Karina meeting again after an undetermined length of time apart. I adored their awkward chemistry at being pulled together again for some vague and HIGHLY intriguing reason. I began “The Brightest Stars” full of questions (something I love) and hope for the story. We are then transported back to several years prior when Kael and Karina first meet. It’s unique and precious, their instant attraction undeniable, and the slow burn as they are thrown together and then pulled deeper is so well done. Sadly, I must insert a “however” here. However… I had some issues with parts of this story. There were social issues that were tackled within the confines of the novel (such as racially motivated police brutality) that were touched on so lightly it felt almost dismissive. I personally would have much preferred to either have this dealt with fully and brought into the harsh light of day for the problem it is or have it not mentioned at all because the fleeting nods toward it felt minimizing and insulting . Additionally, I struggled with believability. Kael was brought up in a rough, urban area by a single mother who, apparently, has some financial struggles because it is mentioned that he sends money home to her (and this felt incredibly like a racial stereotype). He was discharged from the Army for medical issues after being injured while deployed. None of these facts show that he has any great financial wealth… yet we find out that he has purchased two homes with the intent to remodel and rent or sell. I found myself confused and asking how. Sure, he could have purchased one with a VA loan and used combat pay as a down payment, but how could he possibly secure a second mortgage so easily? Along the same vein, Karina is a massage therapist, an occupation that is feast or famine and highly dependent on tips. She also bought a house. These are two 21 year olds. It’s hard to believe that they’d have enough of a credit history to be approved for mortgages when combined, much less solo. And then I got to the end and if I had been holding a paperback book instead of my tablet, I would have thrown it across the room. The story ends in a cliffhanger. An unhappy one. I’m not sure if this is Ms. Todd’s usual style, but as a new reader I wasn’t prepared for it and it made me downright angry. Uttering innumerable curses at the screen level of angry here. There should be a warning somewhere indicating that this is the first in a series and ends in a cliffhanger. I am a lover of over the top, saccharine sweet HEA’s so while I wouldn’t have been happy to know that it wouldn’t end well, I would have at least appreciated a little heads up that happy wasn’t coming my way. I felt like I was handed a first draft manuscript that had been dropped on the ground and had chapters switched or lost. I checked and rechecked the copy of my book looking for the words "proof" or "unedited copy" but found none. This book was not only full of spelling mistakes (including my biggest pet peeve of using the wrong "there") but the characters didn't make sense, the plot was jumpy, and the sequence of events did not match. One second you're reading about how she's faring the day after I felt like I was handed a first draft manuscript that had been dropped on the ground and had chapters switched or lost. I checked and rechecked the copy of my book looking for the words "proof" or "unedited copy" but found none. This book was not only full of spelling mistakes (including my biggest pet peeve of using the wrong "there") but the characters didn't make sense, the plot was jumpy, and the sequence of events did not match. One second you're reading about how she's faring the day after an event and the next the author makes you second guess if you had the timing all wrong and it's really been two months since the event in question. The relationship development of the characters was unrealistic and unconvincing. She barely knew the guy and yet her reactions are so over the top you once again wonder if they'd been together longer and you just happened to skip 12 chapters of character development. The book layout in and of itself was a disaster. Seventy chapters and 301 pages (with this information I am really hoping someone will tell me I got a messed up copy and am missing half the book because really, I am so confused how this even got published) is roughly 4 pages per chapter. These frequent chapter breaks added even more confusion to the flow of the book. They broke up sequences that didn't need a break, or they threw the reader out of the current event into a completely unrelated one making you scratch your head in confusion at what was happening. Plus, the chapter headings took up half a page so in reality the chapters were 3.5 pages long, if even that because the last page would usually only be partially full. And the ending. Don't even get me started. Since the beginning of the book starts in 2019 and then you jump back into 2017, you expect the book to tie full circle. Instead, after revealing a major plot shift, the book ends. No closure. No resolution. No bringing it full circle. In fact, there were so many loose ends that I keep imagining the author stuffing a bunch of half formed book ideas into an envelope, shipping it off to the publisher where no one read the manuscript, but then plot twist! Some one accidentally slapped a stamp of approval on it assuming that it had been OK'd and then before you know it we have a bunch of fire kindling in book form. As soon as I get home this book is going right in the trash. No one deserves to waste their time on this unedited mush of words. Anna Todd is the New York Times and #1 internationally bestselling author of the After series, The Spring Girls and The Brightest Stars. Hailed by Cosmopolitan as “the biggest literary phenomenon of her generation,” Todd began her career on the social writing and reading platform Wattpad where she wrote stories on her phone, publishing a chapter almost daily for over a year. Her hobby soon became h Anna Todd is the New York Times and #1 internationally bestselling author of the After series, The Spring Girls and The Brightest Stars. Hailed by Cosmopolitan as “the biggest literary phenomenon of her generation,” Todd began her career on the social writing and reading platform Wattpad where she wrote stories on her phone, publishing a chapter almost daily for over a year. Her hobby soon became her career as After rapidly gained reads on Wattpad to become the most read series on the platform. She has since written nine additional novels and serves as a producer on the upcoming film adaptation of After. Anna Todd was born in Ohio. She, her husband, and son currently live in Los Angeles. Find her at AnnaTodd.com, on Twitter at @imaginator1d, on Instagram at @annatodd, and on Wattpad as Imaginator1D.